Come Worship with us at one of our THREE Easter Worship Experiences! 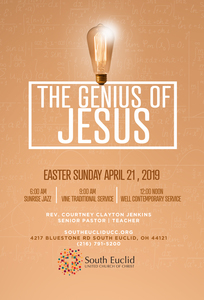 YOU are invited to join South Euclid United Church of Christ on Easter Sunday, April 21st, at any one of our worship experiences -- 6 a.m. Sunrise Jazz, 9:55 a.m. Traditional Worship, and 12 noon Contemporary Worship. We are located at 4217 Bluestone Road in South Euclid (on the corner of South Belvoir and Bluestone Roads). South Euclid UCC is an intergenerational, multi-cultural, and open & affirming congregation of the United Church of Christ.